The challenge for the SPICE system was to take a fundamentally new look at in-flight food service and create a new and optimized galley standard. The SPICE research and performance study is the foundation for one of the most fundamental changes in long-haul aircraft cabin systems in over 40 years. Formation worked with Airbus and partner airlines to research, develop and validate a new global standard that will enhance every aspect of in-flight food service. This methodical research program considered all phases of in-flight food service including menu planning, ground-based food prep + handling, aircraft catering and the experiences of flight attendants and passengers. Initial contextual research was followed by feasibility studies, design development and culminated in a comparative performance study using a full size wide body jet mock-up and flight crews from around the world. SPICE research is central to an ongoing effort focused on enhancing aircraft service, logistics, and catering. It was recognized with an IDEA award in 2008. Current long-haul aircraft galleys and equipment; including ovens, refrigeration systems, food storage, beverage makers and service trolleys are based on standards developed roughly 50 years ago at the dawn of the jet age. Old catering standards have failed to keep pace with advances in air frames and nearly all other aircraft systems. As aircraft have grown in size and travel times have increased, flight attendants have had work harder to provide more meals at higher service levels. In addition to falling short on a human level, old galley standards were never optimized to work with the new generation of commercial aircraft currently under development. The development of the SPICE standard considered nearly every aspect of in-flight food service, including logistics, menu planning, ground-based food preparation & handling, aircraft loading and the activities and experiences of flight attendants and passengers. All ground and airborne systems had to be considered and designed to work in concert and as a system. The logistics involved in providing many hundreds of people with high quality food and drink over the course of a long-haul flight is daunting. The sheer complexity of this task and its orchestration within a constrained environment presented the team with a substantial development challenge. This challenge was magnified by the knowledge that cost sensitive air carriers had a substantial investment in existing equipment. If a new standard was to be successful it would have to demonstrate major crew, safety, operational and economic benefits. 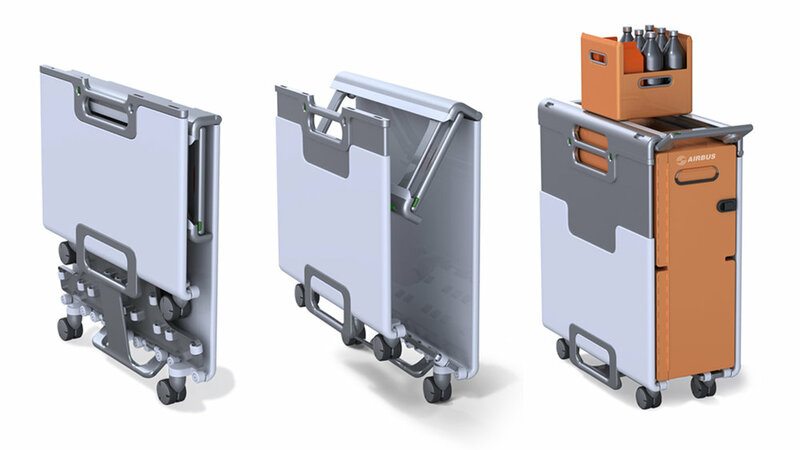 This new galley system achieves major advances in weight savings, space efficiency and crew usability. SPICE galleys are designed to reduce crew workload by assisting with or eliminating many of the most labor intensive lifting and handling tasks. This reduces occupational and repetitive stress hazards for the crew while resulting in enhanced service levels and improved operational efficiency. A typical SPICE equipped two aisle passenger jet would realize a 600kg weight savings while making enough space available for an additional 2-3 economy class seats. The SPICE galley system garnered the inaugural Crystal Cabin Award for Health and Safety in 2007 at the Aircraft Interior Expo in Hamburg Germany. The benefits of SPICE are so significant that the concept has the potential to become the first new industry-wide standard for galleys in over forty years.